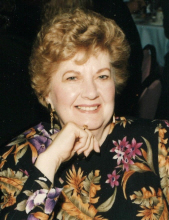 Joan DeStefano, 86, passed away on Wednesday, February 6, 2019. Beloved mother of Thomas, Lisa O'Toole, and Andrea DeStefano. Aunt of many nieces and nephews. Family and friends will gather on Saturday, February 16, 2019, at Presence St. Benedict Nursing and Rehailitation Center, 6930 W. Touhy Avenue, Niles, Illinois, for a 9:30am-10:30am Visitation and a 10:30am mass. In lieu of flowers, donations to St. Jude Children's Hospital would be greatly appreciated. "Email Address" would like to share the life celebration of Joan DeStefano. Click on the "link" to go to share a favorite memory or leave a condolence message for the family.